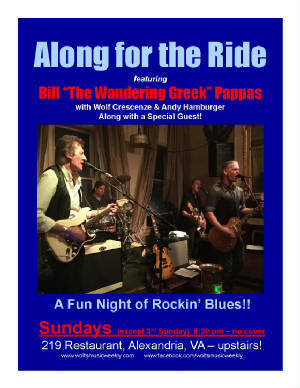 Featuring Bill "The Wandering Greek" Pappas (guitar & vocals) & a Special Guest along with Andy Hamburger (drums) and Wolf Crescenze (bass)! Special guests including Mike Westcott, Linwood Taylor, Big Boy Little & Steve "Baby Jake" Jacobs, Wave Milor + more! All kinds of blues - rockin', down home, Delta, Chicago with a little bit of R&B too! Always a fun night of great blues with these fantastic blues artists! You can catch us at the beautiful 219 Restaurant on the 1st, 2nd, 4th & 5th Sundays and on other nights too! We play upstairs in the cigar bar. Supper club seating with some room for dancing, huge antique bar in the back. Full menu featuring fine creole cuisine and desserts, burgers and wings too! Over 150 kinds of whiskey on their extensive drink menu. Come as you are - sequins or jeans. Great for people watching! Cigar and cigarette smoking permitted with full ventilation. No cover on Sundays.